You’ll love these delicious, low-calorie twists on classic picnic fare. 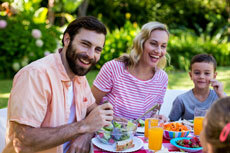 The moment warm weather rolls around, we get visions of backyard picnics dancing in our heads. Juicy burgers, potato chips and fudge bars are great if you’re a 10-year-old who tears around the neighborhood all day long. But as adults, we need to be a little more realistic about our diet. Luckily, there are plenty of delicious, healthy substitutions for classic potluck dishes that won’t leave you feeling like you missed out on summer. With fewer calories per serving and more of the vitamins, minerals and protein your body needs, these nutritional upgrades will become your new favorites in no time. Even “light” mayo has three times the calories and 11 times the fat of Greek yogurt. So if your heart is set on potato salad—already packed with starches and carbs—try using protein-rich Greek yogurt instead, and enjoy all the creamy goodness of your favorite summer salad, guilt-free. That smoky, char-grilled flavor is what actually makes a burger a burger, right? Try a lean turkey burger instead of beef (you can even keep the same seasonings you use on beef burgers—just be mindful of salt) and you won’t even miss the red meat. Surround your burger with a whole-grain “sandwich thin” (about half the size and calorie count of a traditional burger bun). Generously apply ketchup, mustard, pickles, onions, lettuce … but skip the mayo. Potato chips are a picnic classic because the salty crispiness balances out all those juicy BBQ sauces. You can satisfy that same craving for crunch with lightly salted air-popped (i.e., no oil) popcorn. Vitamin-rich, home-baked kale chips can also deliver your salt fix at a fraction of the calorie- and fat count. It sounds almost too good to be true: Whip two frozen bananas in your food processor with “extras” like cherries, coconut flakes, cocoa nibs or nut butter for the creamiest, dairy-free frozen treat ever. Banana soft-serve adds loads of fiber and potassium into the mix, while keeping calories at a minimum (as long as the recipe you choose doesn’t call for extra sugar). Both sour cream and Greek yogurt have a fresh, tangy taste that pairs beautifully with dippables like crunchy carrot and celery sticks. The difference? Greek yogurt has half the calorie count and three times the protein of sour cream. Use Greek yogurt in any recipe that calls for sour cream, and dip away!